The survey, inspired by several other similar initiatives undertaken by both mainstream and LGBT news publications, has a three-fold goal: (1) Gauge the financial health of our community’s largest organizations; (2) Assess these organizations’ strengths, weaknesses and needs; and (3) Provide organizations an extra means for exposure and outreach. 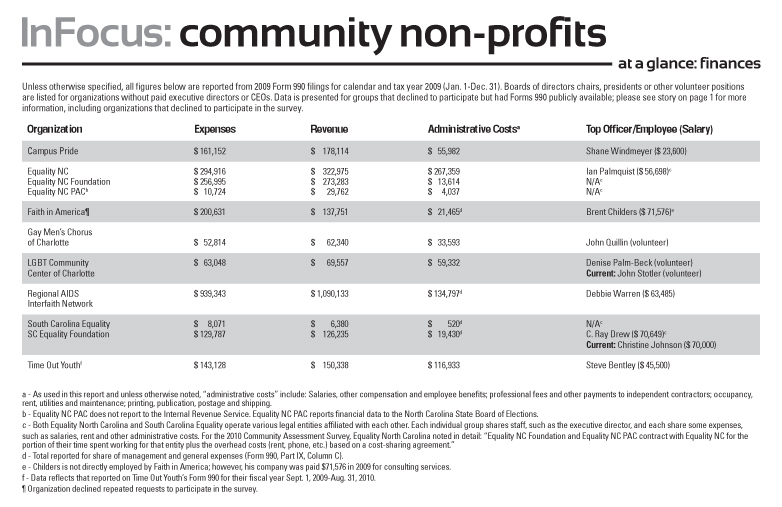 In an historic show of transparency and trust, qnotes’ 2010 Community Assessment Survey resulted in the participation of each of the 22 non-profit groups across the Carolinas asked to complete it. A change in qnotes’ editorial direction and distribution areas earlier this year resulted in a decrease in the number and type of organizations asked to participate in this year’s survey. Of the 16 groups that were asked to participate, nine — more than half — declined. The request for participation included a request for Forms 990 or other financial documents open to public inspection. Forms 990 are the annual tax return forms that non-profit groups must file with the Internal Revenue Service. Many of the groups declining to participate also declined to provide the requested Forms 990 or did not have Forms 990 or other financial reports readily and publicly available either via their own websites or on GuideStar.org. A non-profit group is legally required to disclose their Forms 990 when asked. qnotes first requested each group’s participation via U.S. Postal Service on June 28, 2011. Groups were given nearly a month to complete the short survey and were requested to return it by July 22, 2011. Additionally, qnotes reached out to organizations via email with digital versions of the survey and reminders about the participation deadline a total of five times on June 28, July 12, July 20, July 26 and July 28. Last year’s Community Assessment Survey and the resulting coverage revealed that NC Pride had failed to file their Forms 990 for several years in a row. Though the organization, officially “The Pride Committee of North Carolina,” did complete the inaugural survey, they were unable to fulfill our 990 request. At the time, NC Pride Director John Short said he and his organization would work to fix the oversight; nearly a year later, it remained uncorrected. On June 8, the Internal Revenue Service (IRS) revoked NC Pride’s tax-exempt status — the only active LGBT community organization in the state to lose its 501(c)3 status. Short remained silent for more than a week after the revelation. On June 19, he issued a written statement and said the group was working with the IRS to restore their tax-exempt status. He also noted that 100 percent of the group’s revenue — self-reported at $65,000 last year — came from their Pride Guide advertising revenue alone. There has been no way to officially verify Short’s claims regarding the revenue, though it’s factual inaccuracy is likely certain as the group collects fees and other payments for vendor spaces and other services. Since Short’s brief, written statement to qnotes on June 19, he has repeatedly declined and ignored several requests for more information regarding the IRS revocation, the group’s finances and their leadership (a full, public list of the group’s board of directors and their contact information remains elusive). On July 22, Short also declined to participate in this year’s Community Assessment Survey. “While we will not be participating with your project this year, I can tell you that we now expect to have our 501c3 status restored by December of this year and will be sending you our current 990 form at that time,” he wrote in an email. Charlotte Pride Band declined to participate and did not have any publicly-available Forms 990. The group was founded in 2010 and has not yet been required to file these forms. The Mecklenburg LGBT Political Action Committee declined to participate; their finance reports were not publicly and readily available at the time of this report. One Voice Chorus and Southern Country Charlotte also declined to participate. Though both groups had a Form 990 on file at GuideStar.org for tax year 2008, there were no documents available for 2009, the most recent year for which other organizations had valid Forms 990. Finally, qnotes also requested participation from three of Charlotte’s primarily LGBT faith congregations: Metropolitan Community Church of Charlotte, New Life Metropolitan Community Church and Unity Fellowship Church of Charlotte. Each declined to participate. Churches and other faith institutions are not required to file Forms 990 with the IRS. Just for clarification, of the amount paid to contractors by the Gay Men’s Chorus of Charlotte, the vast majority is for direct, not administrative, purposes. znotes has reported all contractor expenses as administrative. GMCC utilizes contact accompanists, musicians, composers, arrangers, actors, stage directors, etc., which are considered by the IRS to be direct costs because they are utilized to further our mission – to create a society that values and respects its LGBT members – specifically performances and rehearsals. As performing is an integral part of our services, those costs are considered by the IRS to be direct, not administrative, costs. I was on the board of Southern Country Charlotte last year and was not made aware of this request. Who did you contact? Where was the request sent? We will be happy to provide any “public” information that we can. Southern Country Charlotte does not operate in shadows. We are a fully transparent organization. We hope that clears up any confusion as to details on how/when qnotes attempted to contact these various organizations.